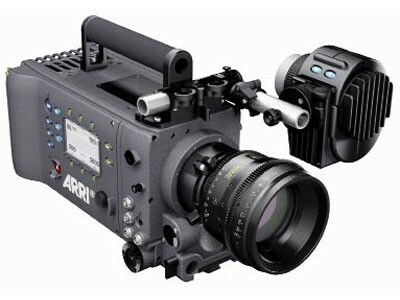 The ARRI ALEXA EV combines all the best features of the Digital Cinema cameras that preceded it. Building on ARRIs tradition of cutting edge camera technology that is designed with the cinematographer and producer in mind, the ALEXA is destined to become the workhorse camera for many forms of broadcast, commercial and feature production. The ALEV III Super-35 CMOS sensor has a native 3.5K resolution and 13.5 stops of Dynamic Range. It rolls off highlights in a natural, organic way while digging deep into dark areas without blue sparkle or mosquito noise. Colors are rendered pleasingly and accurately. When shooting in HD the sensors native resolution is over-sampled 1.5x to deliver an image with low noise, low aliasing, and increased MTF (functional resolution). The ARRI ALEXA EV is versatile both on set and through post. Every aspect of ALEXA is designed to fit into a variety of current workflows both in the field and in post production. One no longer has to work around the limitations of a Digital Cinema camera. For crews used to broadcast cameras or 35mm film cameras, the user interface with the camera in the field is familiar and comfortable. The camera is small and lightweight and runs very quiet without getting hot. Controls are clearly marked and logically located for intuitive use. Commonly used controls are available on the Operator side of the camera while the Assistants side offers a deeper yet easily-navigated menu interface with a large LCD display panel. The camera is comfortable to handhold and sports an all-new full color fully-orientable F-LCOS HD viewfinder which can show a 10% look-around area to the recorded image. ALEXA has built in lightweight 15mm frontrod mounts and can be accessorized for either broadcast-style V-lock tripod plates or film-style sliding bridgeplates in 15mm or 19mm studio. The camera can power over industry standard Anton Bauer or V-mount onboard 12v batteries or large off-camera 24v block batteries. There are many post production paths in use today that can be based on technical needs, speed of use and budget. ALEXA can fit into any of them and the necessary hardware and software is already available and in place. Just choose what is best for a given productions needs. Shoot to Edit allows recording to ProRes4444 or ProRes422 directly on small SxS memory cards (with optional upgrade, see item AR-ALEXAEV-DTE). A 32GB card can hold 15 (4444) or 20 (422) minutes of 1920x1080 HD video and the cards can be hot-swapped in the camera and loaded directly into a Final Cut Pro or latest Avid Media Composer system for immediate editing. Uncompressed HD (4:4:4 or 4:2:2) is also available directly out of the camera in 1920x1080. For a true digital negative level of control of the image, 12-bit ARRIRAW data in 3K resolution is available directly off the sensor without any compression, and various post workflows can yield what ARRI designates a "True 2K" image via oversampling.